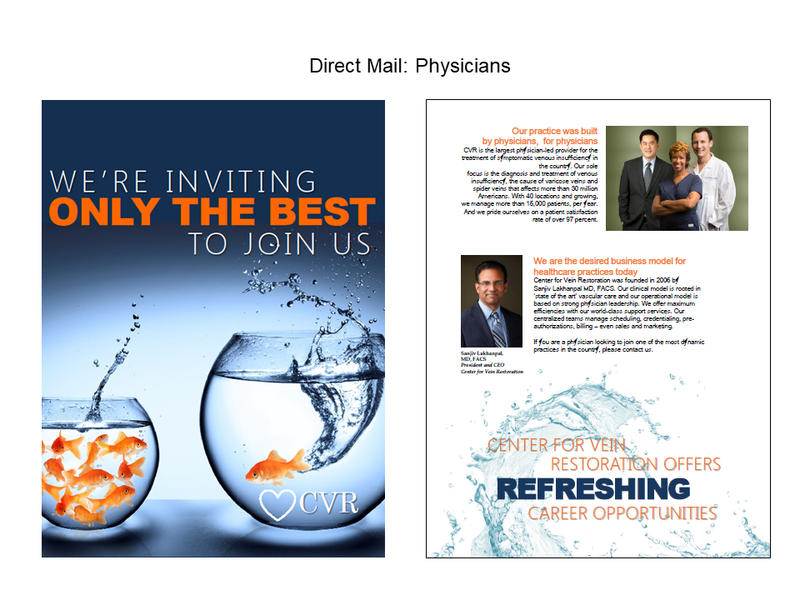 Create a national recruitment marketing campaign for Center for Vein Restoration, the biggest group of private clinics specializing in treatment of varicose and spider veins in the United States. The client needed to get the word out in a quick and compelling way that this medical group was aggressively expanding – 50 clinics in five years. 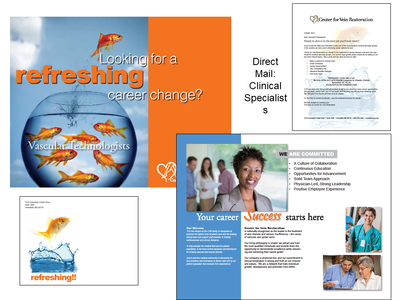 They wished to acquire practices and hire lots of doctors and medical specialists to meet these ambitious timelines. An integrated marketing campaign with attention-getting creative was the answer. 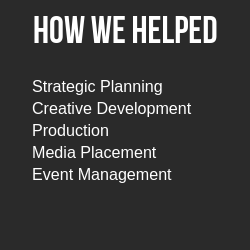 Our approach was to spread the word of “refreshing careers” by melding all aspects of marketing communication such as advertising, sales promotion, public relations, direct marketing, and social media, in a campaign centered around a national convention of medical specialists. 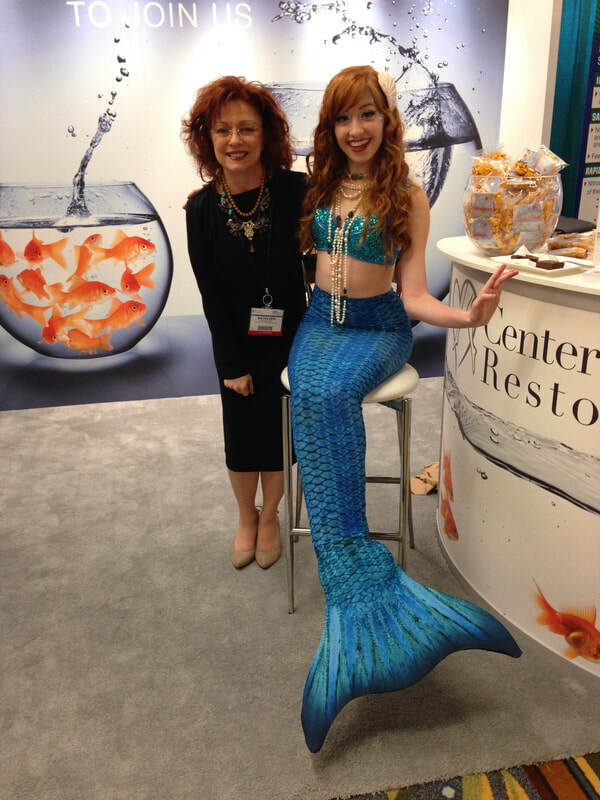 In other words, we were going to “fish where the fish are." The elements converged at a national medical convention, where most exhibitors' campaigns are predictable: images of lab coats, stethoscopes and pharmaceutical ads. 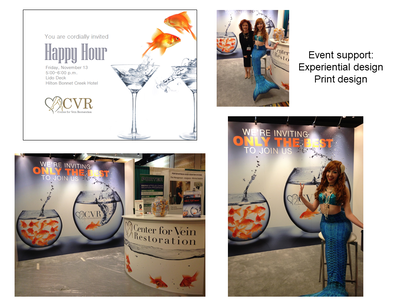 , We designed imagery that would cut-through-the-clutter, create a "buzz" with convention attendees and stimulate curiosity to find out more -- including a hiring a 'mermaid' for the day to sign autographs, pose for pictures and introduce candidates to recruiters. 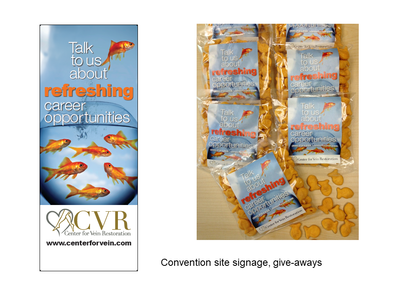 Banners displayed in hotel common areas; “Refreshing Careers” branded meeting room at convention for on-site job interviews with CVR management team.